It is a truth universally acknowledged that a lot of us just can’t get enough of Jane. To the devoted fan of British author Jane Austen (1775-1817), the six books she completed aren’t enough to quench our insatiable thirst for the universe she created. Just four of her novels were published before her death: Sense and Sensibility (1811), Pride and Prejudice (1813), Mansfield Park (1814) and Emma (1815). Two more followed posthumously, Northanger Abbey and Persuasion. A pair of unfinished novels, juvenilia, and letters completes the catalog her surviving writings, a too-short list produced by a too-short life. Although it’s been almost two hundred years since her death, Austen’s novels still occasionally top the New York Times bestseller list. What makes her stories so appealing to new generations of readers? Perhaps it’s the Regency setting or the delicious dialogue. Perhaps it’s Austen’s sense of irony or her keen depictions of society. Perhaps it’s her memorable characters (I'm talking to you, Fitzwilliam Darcy.). In the ninety years since Georgette Heyer began penning novels set in Austen's England, the demand for Regency-set novels has remained relatively strong. Yet readers still crave more than stories similar to Austen's. They crave more of her characters. More of Jane herself. Authors have obliged with piles of fan fiction. The universe of Jane Austen has expanded to include scores of sequels, prequels, spin-offs and mash-ups, as well as fictionalized accounts of Austen’s life, where she's been cast as ingénue, literary spinster, and sleuth. It is my sincere hope that should you find yourself in need of a little more Jane, one of these titles might ease the craving, and like a scone and a spoonful of thick Devon cream, will accompany a cup of tea quite nicely indeed. Image via WikipediaCassandra and Jane: A Jane Austen Novel by Jill Pitkeathly, Harper Paperbacks, 2008. A first-person narrative from Cassandra Austen's viewpoint. I Was Jane Austen's Best Friend by Cora Harrison, Delacorte Books for Young Readers, 2010. Another YA selection, where Jenny Cooper visits her fifteen-year-old cousin, Jane Austen. Just Jane by Nancy Moser, Bethany House, 2007. This inspirational title looks at Austen as a young writer and a woman of faith. The Lost Memoirs of Jane Austen by Syrie James, Avon A; Reprint edition, 2007. What if Jane Austen's lost memoirs were found in the attic at Chawton? And she'd found inspiration -- and love -- in Lyme? Stephanie Barron’s series features Jane Austen as sleuth, all published by Bantam. Austenland by Shannon Hale, Bloomsbury USA, 2008. A thirty-something fan of Colin Firth's Mr. Darcy (um, my, that doesn't sound like anyone I know) receives an all-expense paid trip to a Regency-era/house-party/resort in England. If such a place really exists, please let me know so I can save my shillings and pack my trunk, post haste. Image via WikipediaJane Austen Ruined My Life by Beth Patillo, Guideposts Books, 2009. A heartbroken Austen scholar is lured to England by the promise of newly-discovered Austen letters, and finds a bit of romantic adventure. Lost in Austen: Create Your Own Jane Austen Adventure by Emma Campbell Webster, Riverhead Trade, 2007. Not precisely a contemporary, or a novel for that matter (according to my elementary school teachers, who thoroughly despised the Choose Your Own Adventure books). You are Elizabeth Bennet, and you get to choose how the story progresses. But be warned: you may find love with an Austen hero, or you might be run over by Caroline Bingley's carriage. Mr. Darcy Broke My Heart by Beth Patillo, Guideposts Books, 2010. Claire faces difficult truths about herself and her relationships as she reads an earlier -- and much different -- version of First Impressions, later Pride and Prejudice. Murder at Longbourn by Tracy Kiely, Minotaur Books, 2009. A newspaper fact-checker spends New Year's Eve at her aunt's Austen-esque Cape Cod B&B, but the murder mystery gala goes wrong with, yep, a real murder. Searching for Pemberly by Mary Simonsen, Soucebooks, 2009. Not precisely a contemporary, but it's not a Regency, either: set in post-WWII England, this novel follows an American in London as she discovers connections to the real-life inspirations for Darcy and Elizabeth. And she makes a few romantic connections of her own. Dawn of the Dreadfuls by Steve Hockensmith, Quirk Books 2010. In the prequel to Pride and Prejudice and Zombies, the Bennet girls begin their martial-arts training five years before Mr. Bingley's arrival at Netherfield. Mansfield Park and Mummies: Monster Mayhem, Matrimony, Ancient Curses, True Love, and Other Dire Delights by Jane Austen and Vera Nazarian, Curiosities, 2009. Isn't this one of those occasions where the title says it all? Mr. Darcy, Vampyre by Amanda Grange, Sourcebooks Landmark, 2009. The long-awaited wedding has occured, but something is amiss. Mr. Darcy has a terrible secret in this (non-silly, compared to the Quirk publications in this category) story. Poor Elizabeth. Sense, Sensibility and Sea Monsters by Jane Austen and Ben H. Winters, Quirk Books, 2009. Marianne is rescued from an octopus by Willoughby, and Colonel Brandon has the face of a squid. Pride and Prejudice and Zombies: The Classic Regency Romance - Now with Ultraviolent Zombie Mayhem!, by Jane Austen and Seth Grahme-Smith, Quirk Books 2009. 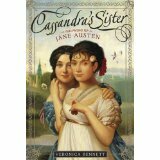 This best-seller is either loved or reviled by Austen fans. But I laughed so hard while reading it that I made more than a few inelegant snorts. Colonel Brandon's Diary by Amanda Grange, Berkley, 2009. Why does the Colonel love Marianne? Perhaps reading his diary might reveal the secrets of this honorable gentleman's heart. An Assembly Such as This: A Novel of Fitzwilliam Darcy, Gentleman, Touchstone, 2006; Duty and Desire: A Novel of Fitzwilliam Darcy, Gentleman, Touchstone 2006; and These Three Remain: A Novel of Fitzwilliam Darcy, Gentleman, Touchstone, 2007. Written by Pamela Aidan, this three-part series covers a third of Pride and Prejudice in each book, as experienced by Mr. Darcy. A Darcy Christmas by Amanda Grange, Sharon Lathan, and Carolyn Eberhart, Sourcebooks Landmark, 2010 -- a collection of holiday novellas about the Darcys and the Bingleys. Mr. Darcy's Daughters: A Novel by Elizabeth Aston, Touchstone, 2003. Mr. and Mrs. Fitzwilliam Darcy go abroad, leaving their eldest girls in the care of the Fitzwilliams. Mr. Darcy's Diary: A Novel by Amanda Grange, Sourcebooks Landmark, 2007. Darcy's viewpoint of his vexing relationship with Elizabeth Bennet. The Pemberley Chronicles by Rebecca Ann Collins, all Sourcebooks Landmark, tell the stories of the courtships of the Darcy children and their cousins: The Pemberley Chronicles (2008), The Women of Pemberley (2008), Netherfield Park Revisited (2008), The Ladies of Longbourn (2008), Mr. Darcy's Daughter (2008), My Cousin Caroline (2009), Postscript From Pemberley (2009), Recollections of Rosings (2010), A Woman of Influence (2010), and The Legacy of Pemberley (2010). Mansfield Park Revisited: A Jane Austen Entertainment by Joan Aiken, Sourcebooks Landmark Reprint Edition, 2008. Fanny's sister Susan visits Mansfield Park. Edmund Bertram's Diary by Amanda Grange, Berkley Trade Reprint Edition, 2008. Edmund is enchanted by Mary Crawford, but it's Fanny who's always by his side. A Visit to Highbury (1995) and Later Days at Highbury (1996) by Joan Austen-Leigh. These are out of print, but worth mentioning because the author is Jane Austen's great-great-grandniece, the lucky gal. Published by St. Martin's Press. Emma & Knightley: Perfect Happiness in Highbury: A Sequel to Jane Austen's Emma by Rachel Billington, Sourcebooks Landmark, 2008. Frank Churchill, now a widower, returns a year after Emma and Knightley's marriage. George Knightley, Esquire: Charity Envieth Not by Barbara Cornthwaite, CreateSpace 2009. The first of two books, told from Knightley's perspective. Jane Fairfax: The Secret Story of the Second Heroine in Jane Austen's Emma by Joan Aiken, St. Martin's Griffin, 1997. Set before Emma, young Jane's backstory is explored. Mr. Knightley's Diary by Amanda Grange, Berkley Trade, 2007. The wonderful Mr. Knightley records his interpretation of the events of Emma. There are a scarcity of sequels for Northanger Abbey, although Henry Tilney's Diary by Amanda Grange will be available in May of this year. Mercy's Embrace: Elizabeth Elliot's Story Book 1, So Rough a Course by Laura Hile, Wytherngate Press, 2009;also Mercy's Embrace: Elizabeth Elliot's Story Book 2, So Lively a Chase, Wytherngate Press 2009; and Mercy's Embrace: Elizabeth Elliot's Story Book 3, The Lady Must Decide, Wytherngate Press, 2010. Anne's sister Elizabeth has her own adventures in these three novels. None But You (Frederick Wentworth, Captain, Book 1) by Susan Kaye, Wytherngate Press, 2007 and For You Alone (Frederick Wentworth, Captain, Book 2), Wytherngate Press, 2008. A two-volume series exploring Frederick's perspective. Lady Vernon and Her Daughter by Jane Rubino and Caitlen Rubino-Bradway, Three Rivers Press, 2009. Lady Susan, an epistolary novel, was written when Austen was about eighteen, and is considered part of her juvenilia writings. A far cry from later Austen heroines, Susan is an adulterous villain. In Lady Vernon, the authors have turned Lady Susan into a full-fledged novel. Linore Rose Burkard's Harvest House novels include Before the Season Ends (2008 ), The House on Grosvenor Square (2009), and The Country House Courtship (2010). Kaye Daycus' books from Harvest House include Ransome's Honor (2009) and Ransome's Crossing (2010). Ransome's Quest will release this August. Julie Klassen's Bethany House novels include Lady of Milkweed Manor (2008), The Apothecary's Daughter (2009), The Silent Governess (2010), and new release Girl in the Gatehouse. The heroine is inspired by Austen and her character, Maria Bertram, and the hero is inspired by Persuasion's Captain Wentworth. A Necessary Deception by Laurie Alice Eakes is an upcoming Baker/Revell release, and The Aristocrat's Lady, a Steeple Hill Love Inspired Historical by debut author Mary Moore, will be released in September, 2011. Keep your eyes peeled for these two! Ruth Axtell Morren's A Bride of Honor is a Steeple Hill publication (2009). Morren's other Regency-set novels are currently out-of-print. Other out-of-print inspirational Regency gems include Tamela Hancock Murray's The Lady and the Cad (Heartsong Presents 2005), and Kimberly Comeaux's Regency Brides (Heartsong Presents, 2006). ACFW Members who have written novels and novellas which aren't set in Jane Austen's England, but whose works (or titles!) have elements influenced by Austen, include Mary Conneally's Pride and Pestilence (Part of Nosy in Nebraska, Barbour Publications, 2009) and Staci Stallings' e-book, If You Believed in Love, which can be read in its entirety on her blog. I hope you've found something you enjoy! If I've missed your favorites, please let me know in the comments section and I'll be sure to add them to the post -- as well as to my shopping list. Please don't tell my husband, but I'm always looking to increase my Jane Austen-esque library. I don't see Jane Odiwe's books on the list - I think she was the one who did Lydia Bennets story and Willoughbys Return. Also Eucharista Wards book The Emancipation of Miss Mary Bennet. But - if any of them are anything like discovering a new hidden Austen novel my vote has to go to Lady Vernon and Her Daughter. Brings Lady Susan into the Regency era and sounds just like Jane! I liked "Jane Austen in Scarsdale" by Paula Marantz Cohen--a retelling of Persuasion. I could not, however, get past the first couple chapters of her "Jane Austen in Boca," which was a retelling of P&P. I actually have called these types of books "Austenesque" for a long time. I don't know where I first read it, but I see it everywhere now. I'm impressed, Susie. Great research. I'm sure this list will bless a lot of people. Of the books mentioned, I love Julie Klassen novels. Silent Governess has been calling my name from the shelf for some time now. Hope to get to it soon. Nice job, Susie! One could read from your list for a year as I think we'll continue to see others coming in thanks to our visitor's! Since I played with my JA post a couple weeks ago, I've seen some additions, myself. I'm hoping to go to a JA event in March with the traveling 'wardrobe' from the latest Emma, the costume designer will be doing a presentation. Wow. I never knew there were so many such books out there! Thanks for the list, Susie! Good morning, Camy! It's great to see you. Thanks for coming by! I've been thinking of you and your Seekerville post about your 13-hr writing marathon... Very inspiring. Thanks for the suggestions, Anonymous! I confess that I've never read any of Odiwe's or Ward's novels, so they are definitely on my TBR list. Thanks so much for coming by and for the suggestions. I hope you were able to see something new on the list! Excellent point about the exclusion of Aston's other novels from the list. You're absolutely right; I wasn't consistent about how many titles I included by each author, and some of these talented authors have written many wonderful Austenesque titles. One reason for my brevity is the sheer volume of books out there. One need only type "Jane Austen sequels" into Amazon and voila, you've hit the jackpot! In the case of Aston, I wanted to offer a sampling. Sometimes, the premise of certain books (not Aston's!) sounded clearly out of bounds for many readers of inspy fiction, so I left them out. There is one author I excluded purposely for this reasons. But for the most part, I tried to offer a sampling -- a plate of small treats to accompany our Jane Austen tea party, if you will. I'll definitely check out the Scarsdale book. Thanks so much for coming by. I hope you enjoy a great weekend! Deb....GASP....a JA event? With a traveling wardrobe from EMMA??? (My voice is going up a few octaves.) That would be fabulous beyond measure. Do you suppose (ahem) that there will be clothes worn by Jonny Lee Miller on display? I am so envious. Can't wait to hear about this event after you get home. Your JA post was wonderful. And it had photos of Mr. Darcy. Doesn't get better than that, sister. Oh Anne, it's wonderful to see you. I've missed you! The list of available Austen books is astonishing, and I'm grateful for every new title someone's told me about today. I am already making out a Christmas list for 2011, LOL. Susie, what a great list, and great fun to read. Beth Patillo and Stephanie Barron's books sound particularly intriguing to me. I have read all of Julie Klaassen's books except The Girl in the Gatehouse - I'm saving it for a weekend where I can just relax and savor it with no interruptions or obligations. Her books are amazing. Dina, you will LOVE The Silent Governess. So, I'm curious, are Julie's books based on Jane's or just set in the era? I forgot to ask, have you read ALL of these? Deb, I want to see pictures from that event! There is a three weekend Jane Austen Festival in Pennsylvania in March. Each weekend features different events plus multiple presentations of a live play of Emma. I chose the weekend that the costume designer comes. I don't know how I'm going to do it but I'm sure planning on going. Oh Susie, you saw right through me. It's it so obvious that I am going just to be near JLM's costumes? Nay, it's research, dear friend. We had some technical difficulties with the Darcy photos as you recall. We lost Eliot Cowen (Mr. Darcy in Lost in Austen). Well, you all did. I still have him. I should be ashamed of myself. But I'm not. Grannies get a lot of leeway in society because of their wisdom and foolishness both. It doesn't say here but I believe the designer has taken a display to different parts of the country, so I'm sure it will be here. I'm so excited for the opportunity to go and I'll post photos, of course. one more thing. I absolutely LOVE Kaye Dacus's RANSOME TRILOGY. She calls it Jane Austen meets Horatio Hornblower. I couldn't put Ransome's Honor down. What we put ourselves through in the name of research! Why must we suffer so? LOVE this Suzanne- thanks for the mind boggling compilation! You totally rock the Jane vibe!! GINA!!! CONGRATULATIONS!!! Just saw the banner!! I'd like to congratulate Barbour on their good taste! Suzie, starting with my purchase of "Mr Darcy's Daughters" a zillion years ago, I've been a pretty faithful Austenesque reader, and I have read many of these books -- some of them twice! -- but not everything. If I haven't read the book I've described, however, it was either recommended to me or I was familiar with it or its author. For instance, I've read one of Beth Patillo's but not the other. I have not read each of Amanda Grange's "Diary" series. Then there are those books I want to read, like those Darcys-as-sleuths novels. They're on my wish list. I haven't read the continuations of Sandition or the Watsons, either. But these books run the gamut of tastes. Most are ABA and you know what that means. If one strikes your fancy, by all means read the reviews before ordering or hunting down at your library. And you're right, Julie Klassen is a wonderful writer. All the CBA authors in this post are gifted women, that's for sure. Enjoy Girl in the Gatehouse! Oooh, thanks for the link, Deb. I'm so envious! As for the costumes...Research Schmeeesearch, Deb. Enjoy being close to JLM's waistcoats! And share the photos! Cheryl, you made my day. Rock the Jane vibe. I need that on a t-shirt. Ladies, I asked for some Jane Austen tea for my birthday and I rec'd the "Miss Elizabeth (Darcy's Distraction)" blend. It's brewing now. I am soooo excited! It has blue cornflowers in it, just the shade of her eyes! We are so excited about Gina's contract, too. Barbour is blessed to have such a talented author in their midst! Thanks for your congratulations, and I'm so glad you could come by today. You rock the Jane vibe, too! I will be your reporter on the spot and make it a blog post. Hmm, would that be history, current events or self-help? Hmm. Do I lose all credibility if I say I'm not a Jane fan? No, that's not fair. I love Emma and Persuasion. Most of the others are all right. Mansfield Park drove me nuts. Fanny was such a wimp. Fatigued after a half mile of walking? Really? Sorry. I'm more a Georgette heyeyr devotee. And, yes, it's past time Gina got herself a contract, and now we can add Lisa to the list, too. Both deserving authors. Deb, it's all three categories for me. Might as well throw in fiction, too. And guest post on my blog. I guess "self-help" day might not work after all. I am starting to think I need an intervention. Hi Laurie Alice! Thanks for coming by! Of course you don't lose credibility. Regencies rock, and Georgette Heyer is wonderful. None of us at the Inkwell agree as to our favorite Jane book. Or Sherlock Holmes mystery, or Agatha Christie novel, or Dickens novel, or genre for that matter. Ah, the things we discuss when we should be writing. Or cleaning out closets, in my case. I hope you're having a great weekend. Thanks again for your visit. Oh, and I forgot to tell you, but thanks for the lemon detox tip! Different post, but I went out of town. Amazing about the hair samples. They say the first step is to recognize the addiction. I see it, I recognize, I choose to remain in my addiction. Hi Laurie Alice!! I know you have a seat of honor here in Inktropolis and probably in the Georgette Heyer Fan Club as well. "I see it, I recognize, I choose to remain in my addiction." Deb, I think you and I are officially JAA -- Jane Austen Addicts. But totally not the Creepy Chapter. true, after all, I love my Brontes, my Gaskell, my Hardy and my Dickens as well. Is this where I get to mention Jonny Lee Miller again? We need to talk to Anonymous. She's definitely in the JAA non-creepy club too. Lady Vernon and Her Daughter... I am going to take that referral right to my library's search engine. I am the author of Mansfield Park and Mummies (the first in my Supernatural Jane Austen series -- you can read the first three chapters excerpt here) and I really appreciate your kind mention of my book. But just an FYI, my second book in this humorous fantasy-parody series, Northanger Abbey and Angels and Dragons is available now (read the first three chapters excerpt here). What a treat to have one of the authors visit! Thank you for stopping by Vera, and for the links. Hey Susie, did you check this out? Vera, thanks so much for visiting! What a delight to have you here. I did *not* know about Northanger Abbey and Angels and Dragons -- oh my goodness, I had to check out the link right away. What a kick! I'm so curious about how you got started writing this series. I'm sure it's a secret, but I'm dying to know which Austen novel will follow! Thanks so much for visiting. I'm so glad you told us about NA, Angels and Dragons, which I'll definitely be checking out. Have a wonderful weekend.